Virtual reality social networks such as AltspaceVR or Bigscreen – and probably Facebook in some form before long – are likely to be far more engaging than our current text-based platforms, so people are more likely to encounter people they are attracted to and want to meet in the real world. First dates in VR will be easier, more convenient and safer, allowing us to interact in a meaningful way with more potential partners before we follow up with a ‘real’ date. The reality show Virtually Dating entertainingly shows people on first dates in VR, most of whom agree to meet for a physical world date afterwards. Machine learning algorithms, given sufficient data, can work out what will and will not best achieve their defined objectives. While AI has been used to improve results on dating apps such as Tinder, this will go further to recommending people on where to meet, what to wear and what to say on your dates, depending on the personality profile of your date. We may see earpieces being used to suggest to people what they should say in their conversation to get the desired response, in a modern equivalent of Cyrano de Bergerac or Roxanne. While there is not scientific consensus, studies appear to show that people are attracted to those with compatible DNA. 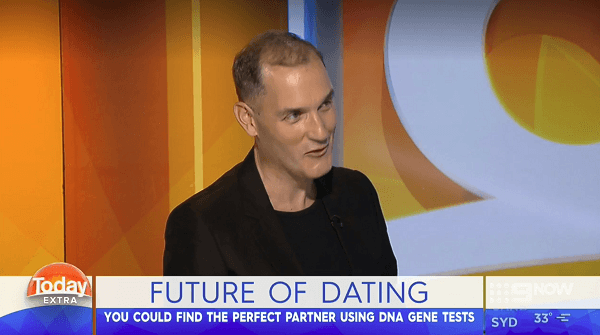 On that basis GenePartner and more recently Pheramor use DNA testing to match customers with dates who have ‘compatible’ DNA. Badoo and Dating.ai allow people to upload photos of their celebrity crush – or perhaps their ex – to find singles near them who look like those they are attracted to. Going further, in Russia Facefind accesses the facial database of Vkontakte – Russia’s largest social network – to identify the name and profile of people you see in the street or a bar and like the look of. A lot of this can sound pretty dystopian, and arguably much of it is. However some of the new dating technologies may help bring together people who would otherwise be alone. Our attitude to these technologies is critical, as we’ve already seen with the abuse as well as use of mobile dating apps over the last years. Certainly we can be sure this is just the tip of the iceberg in the dating technologies that will emerge in coming years as we relentlessly seek romance.